Several large Italian churches are also self-contained observatories and time-keepers. Because of their size and because so many of them have cupolas these architectural features have been used to guide the sun’s rays and produce more accurate calculations of time. 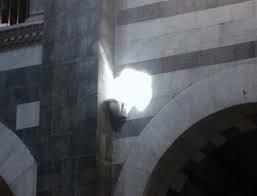 For example, the gnomon in Pisa’s cathedral is used to compute the start of the traditional Pisan New Year at the spring equinox through the sun’s rays hitting a particular part of the building. Sun-dials are a variation of the gnomon. Usually smaller in size, they grace gardens church steeples and the facades of buildings. 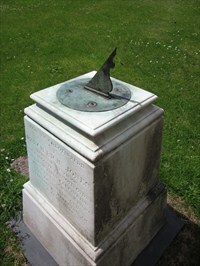 Sun-dials were used as clocks and were sometimes made by clock-makers: in the churchyard of St Mary’s, Llanfair Caereinion, Powys, for example, there is one made by a local welsh clock-maker, Samuel Roberts, in 1755. Despite the incredible advance in astronomical equipment, the advent of the digital observatory and the use of space telescopes there is still a place for the gnomon today as proved by the elegant re-shaping of Piazza Allende in the small village of Filettole which is near Pisa. We were on our way to the seaside a couple of days ago when we decided we’d get there in a leisurely way using by-ways and noticed this object. It is, in fact part of a gnomon. All we needed to tell the correct time was for the sun to come out – a somewhat capricious event in this strangely unpredictable Italian summer. The whole project was unveiled in 2004 and, in the words of its architect, is intended to provide a civic gathering place, recreation area and market place. What a good idea to pave the village centre in this manner! When we eventually reached the seaside at Marina di Vecchiano it was to massive rolling waves and a red flag which signalled “dangerous conditions for swimming”. We, at least, managed to get a virtually deserted beach so close to Ferragosto (on August 15th – the Italian bank holiday) and a hydro massage on our backs lying at the water’s edge. It all reminded me of a typical day by the seaside in the UK!